Every person has a story. 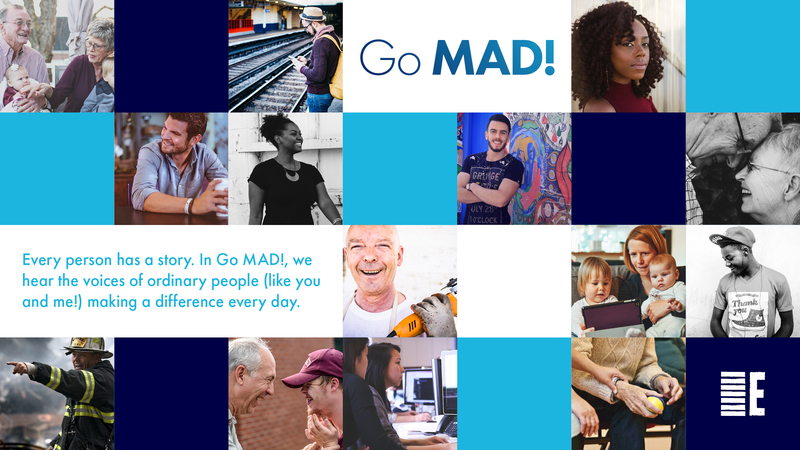 In Go MAD!, we hear the voices of ordinary people (like you and me) making a difference every day. Chao, part of Everyday Kingston, shares about life as an investment banker at one of the world’s largest banks. Chao, how did you get into investment banking? I came here from China on a program to study Engineering, thanks to my mother (and God’s provision!) finding an article about it. I’d never considered finance but I graduated when the financial crisis hit, and engineering firms were not hiring new graduates. The banks were still hiring, and when I started working at a bank I found there were similarities in product design, a professional approach and using knowledge to serve clients honestly. I found it incredibly draining at the start, working 12-13 hour days without breaks and eating three meals at my desk. The culture is focused on hard work for monetary reward. I found that it was drawing the bad, rather than the good, out of me. It’s easy for money to become your focus. I started to negotiate with God about giving money to the work of the church: ‘Lord, I’m married now, the only one working, can I give less than this amount?’ When I got a bonus, I’d ask, ‘Do I need to give a percentage of all of it?’ I wouldn’t say that struggle is gone, but God has blessed me a lot. As I’ve been honest with Him, He has helped me in a really detailed way and shifted my mentality. My wife and I discuss giving as a couple and we pray; we ask God to speak to us individually about how much to give and it’s amazing how many times God gives us the same number. Though I can’t give as much of my time to serving as I’d like, God has reassured me that in this season, being able to contribute a greater amount financially is meaningful and I’m grateful He’s made this possible for me. It’s a privilege to do it; we have the opportunity to rule with Jesus and resourcing the church and the work of the kingdom is part of this. How do you spend time with and connect with God? I wake at 6 am, leave by 7 and commute for an hour, have no breaks at work and leave around 7 pm. I see my daughter for 15 mins in the morning and don’t usually see her in the evening. Finding time to focus on God and mission is difficult. I’ve made it a discipline to do daily reading on my commute. I try to remember to pray before calls and meetings and to be sensitive to when colleagues are in need, especially spiritual need. Loving people at my work is about time and genuine interest rather than providing for material needs. What’s been your experience of being a Christian in the workplace? I’ve had a constant internal struggle about work and purpose. Since the time I became serious about my faith I’ve asked myself if I should be in full time ministry in a church context. I’ve really searched and sought to understand, read books like Tim Keller’s ‘Every Good Endeavour’, and have tried to listen to how God is leading me. I have friends from university and colleagues who are very successful in a worldly sense; by 30, a lot of them had multiple properties in central London. Money and success are their idols. The mentality is similar to Darwinism: only the strong survive and the weak are eliminated; to get to the top of the food chain, you must eliminate others. It’s very difficult for them to have any motivation to pursue God because their lives are so comfortable and there is so much pleasure they can pursue. At the same time, there’s a universal emptiness I’ve witnessed firsthand. A lot of them don’t know what to do with their free time and money, so they pursue things like wine investment. There’s a desperation to preserve and increase wealth and a lot of boredom. When the busyness goes away, there’s a lot of emptiness. I’ve found it’s easy to be different if I hold true to what I believe and hold true to Jesus. I’ve seen victory and life shine through when I’ve stood firm and chosen to forgive and go the extra mile when people have broken their word, or taken advantage. I’ve tried to openly speak about God and why I’m behaving differently, because I want them to see that I do this because I follow Jesus. It’s very powerful and resonates deeply to be consistent. I’ve actively invited my friends and colleagues to church services, and every opportunity I am given (for example to speak at a summer series), I take especially so I can invite them. All of them came for my baby girl’s thanksgiving and a colleague’s husband talked about the atmosphere and the positive atmosphere, and that he would consider finding a church. This group of people is in desperate need of spiritual truth. They will see it’s true if we let them see the truth in us; they perhaps just haven’t had the opportunity. There aren’t many Christians in an investment banking environment, especially amongst the Chinese. Are there other ways your faith affects your work and career? My two main considerations in changing to my current role were: first, that I’d have the opportunity to witness to more Chinese people as this new role requires more travel to China. There is spiritual hunger amongst Chinese people; it’s very easy to share your faith as people aren’t offended and are very interested in discussing it. Secondly, I’d also be travelling more in Muslim countries and have recently been impacted by prophetic words about bringing back faith to Jerusalem via the Silk Road. The workload has increased and I have a very real sense of the danger to my spiritual health and welfare: stress, peer pressure to conform. It would be easier if I lied a bit, backstabbed a bit, and there are a lot of opportunities to do this. There’s temptation when people give you ungodly advice. It’s easy to forget the higher calling and the mission of God, easy to blend in and not see the opportunities. You can start to lose faith and hope in people being changed, and either see yourself as morally superior or that you don’t need to be as nice: the world is a bad place and you can only survive by following its rules. As I progress in my career, and now have a wife and family, the stakes become higher. It’s a daily decision to follow Jesus and be consistent and different. I can also be different in how I approach work and people. For example, when a new colleague joins, the world’s view is to be cautious, assess, keep key know-how to yourself so that you can be a step ahead. The loving way is to want the person to be as prepared as possible in their new environment. I always remember how I felt when I started and I download my knowledge to others. The world sees people as a resource. If you hire the right people, you can extract value from them. If I hire the wrong person, there’s an opportunity cost. Does their skill set fit with what you want from them? I’m very involved with hiring in my current role. I focus on building trust with people even while they are still candidates. I give them the downsides, which they don’t hear from others, and I analyse the role, putting myself in their shoes. I care about them as individuals and try to show that I am already thinking about them. Some friends have become managers and they say that the higher the climb, the darker the world. They tell me I should never be close to my team members because it’s not possible to manage them otherwise. I can’t help thinking I’ll choose a different way until proven wrong. I want to be true to how Jesus led His disciples and love and want the best for my team. When you choose to listen to God, though, there are many opportunities. I’ve found myself having dinner with Muslim clients and talking about faith. We are Jesus’s body to love the world; the Holy Spirit will always open doors if you ask for opportunities to share the gospel! It was a huge privilege to sit with Chao and be stirred by his passion for God, zeal to shine where he’s been planted, and love for his colleagues and friends who don’t know Jesus. I was so impacted by his candour and courage. What would our workplaces, schools, communities look like if we all lived more like this?